A true one pot meal. Pork steaks are browned and then cooked until tender. At the same time and in the same pot a mushroom gravy simmers and sliced potatoes are cooked until tender. 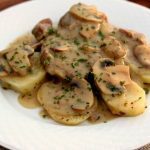 Serve the pork over the top of the sliced potatoes and then ladle a generous portion of the mushroom gravy over the top. A good old fashioned dinner! Turn your Instant Pot to the saute “more” setting. While the pot is heating up trim your pork steaks of excess fat. Generously salt and pepper your pork steaks. When the pot reaches HOT on the display add in the oil and let it heat for a minute. Then arrange each of the pork steaks on the bottom of the pot so they are all in contact with the bottom of the pot (you may need to work in batches). Let the steaks brown for 5 minutes. Do not move the steaks or turn them over for the full 5 minutes. You’ll be tempted to move them or mess around with them, but don’t. When the 5 minutes is up remove the pork steaks and place them on a plate. I only browned one side of the steaks for sake of time but if you want you can brown both sides. Add the onion into the hot pot and saute for 3 minutes. Add in the garlic and saute for 1 more minute. Pour the chicken broth in and deglaze the pot. Stir in the mushrooms, mustard, lemon juice and tarragon. Nestle the pork steaks into the pot. Place the potatoes in a oven safe dish that will fit inside your Instant Pot. You can use a pyrex,* corningware* or cake pan*. Salt and pepper the potatoes and toss. Cover the dish with foil. Gently lower the dish into the Instant Pot on top of the pork. Cover the Instant Pot and secure the lid. Make sure valve is set to sealing. Set the manual/pressure cook button (high pressure) to 6 minutes. After the time is up allow the pressure to release naturally for 10 minute. Then release any remaining pressure by moving the valve to venting. Carefully remove the dish of potatoes and set aside. Pour the half and half into the sauce. Turn the Instant Pot to the “saute” more setting. Stir 2 Tbsp of cornstarch and 2 Tbsp of cold water together in a small bowl until smooth. Stir the cornstarch slurry into the pot and let the sauce thicken. You may need to make more slurry and add it in, depending on how thick you want your sauce. To make gluten free: Just double check chicken broth to be sure it does not contain gluten.